My youngest daughter Bridget (who is four years old) has trouble going to sleep most nights. She is always trying to prolong bedtime either with another story, a drink or a trip to the bathroom. Sometimes it is just that she is scared to be left alone and she worries about “monsters” in her closet and under the bed. I only recently learned about The Shrunks and now I am so glad I did because now we all are getting more sleep. The Shrunks mission is to help eliminate your kid’s fears whether it be monsters, ghosts, thunder or aliens to name a few. 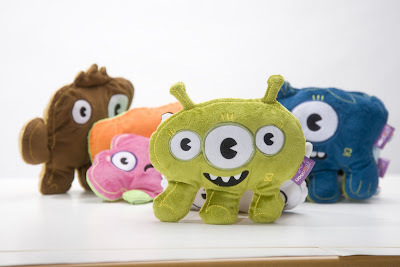 The Plush UduDolls are based on the common fears that kids have and they have seven to choose from. The UduDoll I received for review is called “Pillow Man”. He’s comes in three sizes – 4, 8 or 12 inches and he is afraid at night too! He is there to keep your child “safe” at night and keep the fears away. I explained to Bridget who Pillow Man was and how he also has fears at night and will sleep with her to protect her. Well since I told her that she has been keeping Pillow Man close at hand. She loves him and not only because he is so cuddly and soft, but because he is her friend and understands what is like to be afraid in the dark. She sleeps with him each night and seems to fall asleep faster with him in her arms. I am very pleased with the effect Pillow Man is having on Bridget and glad that some of her anxiety is eased. It’s a great product and affordable too with the price for the 8 inch UduDoll only $12. I definitely recommend if your little one has trouble sleeping at night or if you just want a super cute and ultra soft stuffy! Receive a free 8 inch UduDoll with purchase (same or greater value) when you mention Simply Stacie in the “Heard From” section of your member registration.